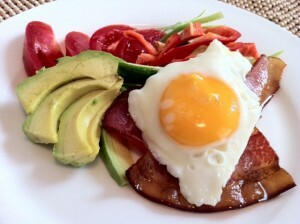 Ketogenic diets… good or bad? A high fat, moderate protein, and low carb diet that forces the body to break down fat into ketone bodies which can be used as a replacement for glucose to our brains. The increased number of ketone bodies in our blood is referred to as ketosis. Diets that force ketosis have become popular for weight loss, with the low carb Atkins diet being a variation of this. Is there a healthy way to follow a ketogenic diet? Are there any health benefits of trying this type of diet? Does it work? Ketogenic diets have been shown to help in reducing overall body fat, with some studies showing participants losing two to three times as much weight as a compared to a low calorie low fat diet or a diet following the dietary guidelines. Why does it work? Having a decent intake of protein with this diet helps to control appetite, so although calorie counting is not generally required, those on this diet tend to eat less overall, partly due to physically not feeling as hungry. There are also very severe restrictions on food choices overall due to the very low carbohydrate rule acting to rule out many of the foods that are common comfort foods such as chocolate, cakes, chips, takeaway foods etc. Add to this the fact that using fat for the primary energy source is a less efficient process than using carbohydrate, which means just making ketones available to be used as energy for our body burns up more calories. Then of course you are burning fat, which of course leads to less body fat being stored, and a higher rate of fat being used up through the day. What are the health benefits? Most diets that lead to weight loss will have the associated health benefits that come with losing weight such as lower blood pressure, cholesterol (assuming healthy fats are consumed and not just saturated unhealthy fats), and blood sugar levels. There have also been studies showing improvements in epilepsy and a number of other neurological disorders. While these kinds of diets will produce weight loss initially, the follow up studies aren’t so promising. Generally by 12-24 months, the weight has been regained (sometimes plus some) as restrictive diets are very hard to sustain long term. Who is a ketogenic diet NOT appropriate for? Vegetarians or vegans will find this diet is not appropriate due to the large amounts of meat required, those who are aiming to gain muscle mass will find a diet including both protein and carbohydrate is required. Diabetics who are taking medication/insulin injections should be avoid low carbohydrate diets, as there is a risk of hypoglycemia which can be life threatening if blood sugars fall too low. In terms of psychological impact- if you have a large amount of weight to lose and feel you would find it hard to limit yourself to 30g of carbohydrate or less a day (the equivalent of an apple and 2 crackers) for a long period of time this diet might not be for you. Many struggle to deal with the physical side effects that happen initially- fatigue, headaches, inability to concentrate, bad breath, mood changes, increased irritability, weakness- may want to think long and hard before considering this kind of extreme diet. It would be much worse to try this diet, lose weight, but then regain the weight plus more if you weren’t able to maintain the diet or couldn’t find a maintenance diet that worked for you. Personally I could see myself going to town on a family sized block of Cadbury’s if I wasn’t allowed any carbs for more than a day or two, but that’s just me. There is also the risk to heart health if a lot of animal products are being consumed, which contain saturated fat- with a known link to cardiovascular disease. So what does all this mean? Whether you try a ketogenic diet or not depends on each individual and their goals. If you have cleared things with your doctor, and there is no medical reason indicating this type of diet is not safe for you, if you want a bit of a kick start to your weight loss and feel confident you can transition back into regular healthy eating patterns after a time so you can assure weight maintenance, and if you have the mental strength to fight through the rather difficult side effects that happen initially, you could give it a try! Everyone is different, and what works for one person may not work for someone else, and the health benefits that come from weight loss by any method can’t be denied.